The main resource for genealogy in Zeeland is Zeeuwen Gezocht, the database of the Zeeland provincial archive. I reviewed this website last year. There are regional and local databases for Schouwen-Duiveland and Vlissingen. Genealogie Zeeland is a portal site for Zeeland genealogy. Unfortunately it is only available in Dutch. There are two provincial image databases: Beeldbank Zeeland (Image database Zeeland), maintained by the provincial libraries, and Zeeland in beeld (Zeeland in pictures), by the provincial archive. There are also many regional and local image sites, e.g. Schouwen-Duiveland, Vlissingen, or Goes. For indexes of cemeteries and photos of tombstones visit Graftombe (Tomb). The website Online Begraafplaatsen (Online Cemeteries) has pages for the regions Schouwen-Duiveland, Tholen, and Walcheren. 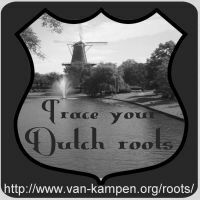 You can discuss your Zeeland roots at the Ancestry message board Zeeland or at the Yahoo mailing list for Zeeland genealogy list. For more information see Genealogy in Zeeland.